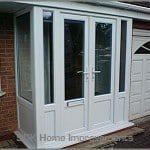 SGK offer a range of entrance porches in aluminium or PVCu, that is guaranteed to adds a stylish new entrance to your home with the advantage of providing you with additional space. 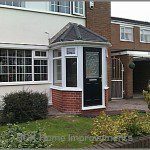 We design our bespoke entrance porches specifically for your own type of home. 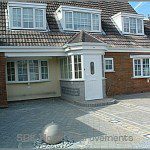 It remains one of the best ways of changing or improving the front of your house, make your entrance hall warmer and more energy efficient. We offer a range of roof designs such as pitched roofs, flat roofs, gable roofs, hipped, ridged and much more. We can also help you choose your bricks and tiles. We can also advise you on what may be better for your porch walls, such as dwarf walls or even full height. A choice of doors and windows for the ultimate porch. Choose from our advanced range of aluminium and PVCu windows, doors and sliding doors. Our porches are crafted from scratch to enhance your home with an additional layer of security and kerb appeal. 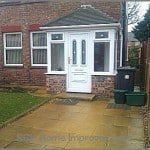 SGK are specialists in providing affordable, functional and secure entrance porches. 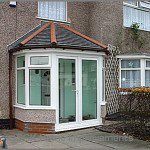 We offer a choice of roof designs. Complement your new porch with a high security door. 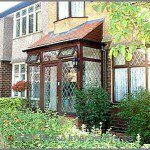 Our crafted porches are suitable for the front or rear of your property. 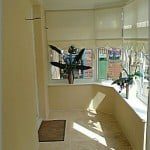 We can even help with internal flooring and decoration. 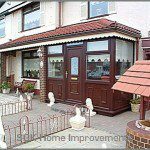 Entrance porches by your local experts.